Warm reception to hot proposal means cool future for CGPS-science in the land of fire and ice, Iceland. Continuous GPS made the national news in Iceland this month after the Icelandic Center for Research (RANNIS) awarded funding for a significant expansion of continuous GPS networks in Iceland. 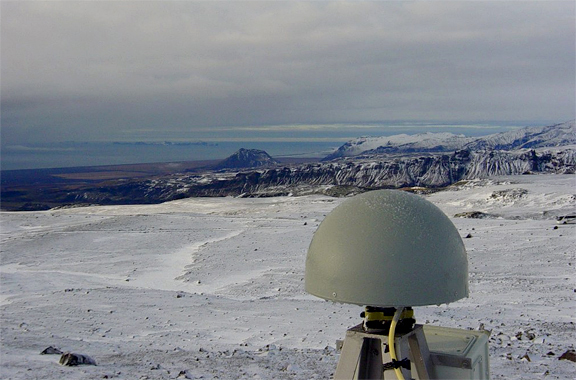 The project titled "High-rate continuous GPS observations in Iceland" represents an international collaborative effort to construct a spatially dense high-rate continuously operating GPS network across the island of Iceland (Figures 1 and 2). The objectives of the project are many, including measurement of high rate GPS data at points near active volcanoes such as Grímsvötn, Hekla and Katla, measuring temporal variations in deformation, and determining the pattern of uplift, which exceeds 20 mm/yr in places. Stations will also be installed in the most seismically active regions of Iceland including the South Iceland Seismic Zone and the Tjörnes Fracture Zone. Figure 1. Existing continuous GPS station from the ISGPS network in south Iceland, Solheimaheidi (SOHO), operated by the Icelandic Meteorological Office. Photo courtesy of Halldór Geirsson. Figure 2. Tectonic map of Iceland showing rift zones (brownish stripes), active volcanic centers (open semi-elliptical shapes), faults (black lines), fracture zones (dashed straight lines), glaciers (white irregular shapes), and CGPS stations (circles, triangles, and squares). Red squares show the existing continuous ISGPS network operated by IMO/NVC (18 stations), IGS (2 stations) and NLSI (1 station). Purple triangles and blue circles show proposed and forthcoming CGPS stations from this project. 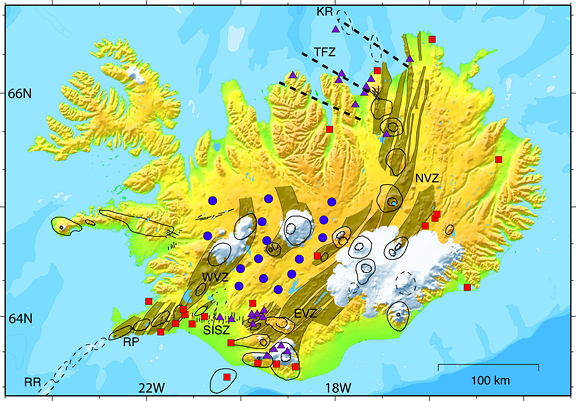 EVZ = Eastern Volcanic Zone; KR = Kolbeinsey Ridge; NVZ = Northern Volcanic Zone; RP = Reykjanes Peninsula; RR = Reykjanes Ridge; SISZ = South Iceland Seismic Zone; TFZ=Tjörnes Fracture Zone; WVZ = Western Volcanic Zone. The coordinator of the international effort and principal investigator on the RANNIS proposal is Dr. Thóra Árnadóttir, research scientist at the Nordic Volcanological Center, Institute of Earth Sciences at the University of Iceland. Project collaborators include scientists from Iceland, Switzerland, Japan, and the United States. In addition to Dr. Árnadóttir, the research team includes Halldór Geirsson at the Icelandic Meteorological Office, which runs the current CGPS network in Iceland, Dr. Sigurjón Jónsson at Eidgenössische Technische Hochschule (ETH) in Zurich, Switzerland, Dr. Shinichi Miyazaki at the Earthquake Research Institute, University of Tokyo, Japan, Dr. Peter LaFemina at Penn State Univeristy, and Drs. Sigrún Hreinsdóttir and Rick Bennett at the University of Arizona. Additional funds to support the project are anticipated from the University of Arizona (Dr. Bennett), the Pennsylvania State University (Dr. LaFemina), and four pending proposals that would support further development of continuous GPS in Iceland: one to the ETH Research Fund and one to the RANNIS Instrument Fund (Dr. Jónsson, PI), one to the Japanese Science Fund (Dr. Miyazaki, PI), and one to the US National Science Foundation (NSF) Geophysics Program (Dr. Bennett, PI and Dr. Hreinsdóttir, Co-PI). Modified August 30, 2006: Links to new Iceland GPS sites!